Would U.S. air power work in Iraq? With the Islamic State in Iraq and Syria (ISIS) making significant gains over the past week, including advancing closer to Baghdad, U.S. President Barack Obama is reportedly considering whether to deploy U.S. air power to assist Iraq's armed forces. But what would such an intervention mean in practical terms? And how effective an option would it be? GPS speaks with Karl P. Mueller, associate director of the Strategy, Doctrine, and Resources program at RAND Arroyo Center and a senior political scientist at the RAND Corporation. The views expressed are his own. Could U.S. air power be used to intervene in Iraq at low risk to U.S. aircraft and personnel? Yes. 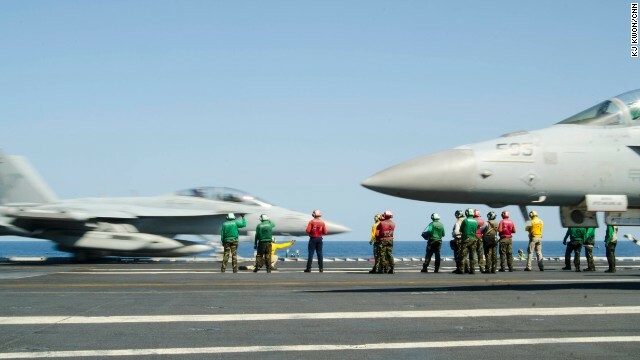 Numerous U.S. aircraft are already located in the region, particularly in Qatar and on the aircraft carrier USS George H. W. Bush, which moved into the Persian Gulf over the weekend. Additional aircraft could be deployed quickly, and there are many nearby land bases from which U.S. or partner aircraft could operate if permission were granted by the host nations. The 2011 air campaign over Libya faced little in the way of air defenses, suffering only one aircraft lost (to a mechanical failure) and no casualties among the intervening forces. Air defense threats from ISIS would likely be even weaker. However, it would be naïve to intervene with the expectation that there would be no losses of aircraft or personnel at all, and were any aircrew to fall into the hands of the insurgents, the results could be expected to be grisly. The financial implications of an aerial intervention would be modest because most of the forces needed are already assigned to the theater. The Libya operation cost the United States and its allies less than $3 billion over eight months, an amount that pales in comparison with the bills for the current ground war in Afghanistan. So, would it look like the Libyan intervention? In strategic terms, intervening in Iraq would have more in common with the U.S. role in South Vietnam in the early 1970s or in contemporary Afghanistan, or the recent French intervention in Mali, than with the operations against Gadhafi’s regime in Libya or the former Taliban government in Afghanistan because in this case, the United States would be attacking an insurgency rather than supporting one. Tactically, on the other hand, the specific missions that would be involved in an Iraq intervention would indeed resemble those of the air campaign in Libya. Western air power proved very effective at stopping Gadhafi’s forces from advancing on rebel strongholds and crushing the uprising before it became viable; coalition air power then mauled the regime’s military forces to make rebel victory possible. However, bombing did not, as some had optimistically hoped, coerce Gadhafi into surrendering or abdicating. In Iraq it would presumably play similar roles. How might U.S. air power be used in Iraq? The first job of air power in Iraq would be to help stem the advancing tide of ISIS, mainly by striking their forces advancing toward Baghdad or other cities not already under their control, along with other targets that underpin ISIS’s ability to fight. Once that was accomplished, air reconnaissance and strikes could be used to support counteroffensives by Iraqi security forces – or other troops – to roll back the insurgents’ recent gains. In the face of U.S. air power, ISIS forces would need to disperse or conceal themselves to reduce their vulnerability to air attack, which would impede their ability to fight against their enemies on the ground. As experience in Libya and other recent conflicts have shown, finding and identifying targets is the fundamental challenge in such situations – once they are located, bombing them is comparatively simple. This is particularly true with enemies such as ISIS and their allies, whose irregular forces tend to present ambiguous rather than easily recognizable targets. Even small numbers of Western advisers serving as liaisons between air power targeteers and friendly forces on the ground would prove invaluable, and indeed may be essential in a case such as Iraq, where local forces’ calls for fire may not be entirely trustworthy. Would the use of U.S. air power cause a lot of civilian casualties? The popular impression that the deployment of airpower automatically makes conflicts more deadly for civilians is a myth. Large-scale, indiscriminate bombing can certainly kill large numbers of noncombatants, but the United States hasn’t conducted such attacks in more than 40 years. In Libya, every bomb dropped by coalition aircraft was precision-guided, and the civilian death toll may have been as low as one per hundred bombs used. It is ground war that is generally most deadly to bystanders, and civil wars tend to be especially bloody. Nevertheless, air strikes would certainly kill some Iraqi civilians. Moreover, limiting civilian casualties when operating in heavily populated areas, especially cities, requires great care, which in turn constrains the use of air power against enemies there. An adversary that mingles with the populace presents serious target-identification problems, even when using precision weapons with small warheads. It’s likely that U.S. aircraft operating over Iraq would often have to hold fire instead of striking targets in urban areas. Would air power alone be enough to achieve U.S. objectives in Iraq? And of course, even if ISIS were defeated with the help of Western air power, whether the outcome would ultimately be a strategic success for the United States hinges on what comes next in Iraq. Air power is a potent instrument for changing the course of wars, but as experience in Libya shows, shaping what happens in the wake of the conflict means building influence on the ground and devoting sustained effort to the often difficult problems of postwar stabilization. It would have limited effects against a Guerilla War. As they don't have bases or large troop movements that can be hit. It is time for the Nations of the Middle East to police their own neighborhood. Saudi Arabia an Egypt an Jordan all have updated U.S. Manufactured Fighter Aircraft F15,F16 as well Saudi Arabia had AWACS . Besides they can afford a war better then the U. S. can currently as we still haven't finished paying for the last two.besides the fact Saudi Arabia are Sunni Muslim . These are the same group that USA has been funding in Syria. So let me get this straight – fund them in Syria and bomb them in Iraq. WOW! There are many "groups" fighting in opposition to Assad in Syria. How do you know which group the US has actually helped fund? Your blanket conclusion is like saying "If a Yankee pitcher strikes out a Boston Red Sox batter, he therefore has struck them all out." The wild card in the sectarian war that will soon engulf the entire Middle East, including Persian Gulf oil monarchies and their extreme brand of Sunni religion which treats their majority and badly abused temporarily laborers from around the rest of the Muslim world who, given a chance when the sectarian war reaches these oil-rich nations will revolt against the monarchs and their heavily American armed troops, is Israel - read carefully: the real wild card is what Israel will do as borders (what side the Jewish state favors) are redrawn during the sectarian war which, incidentally, can spread to many Muslim majority nations outside the region - there are 49 of them including Indonesia, India, Pakistan, Nigeria and other African and Asian nations. As well, once the Middle East and other oil supplies are halted due to conflict, China can be expected to become militarily involved in order to keep the fossil fuels flowing even if it means confronting Nato forces, including America. By the time the Christian holiday of Christmas arrives, the sectarian war will be global, also involving millions upon millions of Muslims living in the United States and across Europe and Britain where the Christian majorities who generally speaking have been taught to loath Islam, will slaughter and/or throw them into concentration camps reminiscent of Nazi treatment of Jews. FYI. There are an estimated 1.6 billion Muslims around the world, making Islam the world’s second-largest religious tradition after Christianity, according to the December 2012 Global Religious Landscape report from the Pew Research Center’s Forum on Religion & Public Life. Although many people, especially in the United States, may associate Islam with countries in the Middle East or North Africa, nearly two-thirds (62%) of Muslims live in the Asia-Pacific region, according to the Pew Research analysis. In fact, more Muslims live in India and Pakistan (344 million combined) than in the entire Middle East-North Africa region (317 million). However, the Middle East-North Africa region has the highest concentration Muslims of any region of the world: 93% of its approximately 341 million inhabitants are Muslim, compared with 30% in sub-Saharan Africa and 24% in the Asia-Pacific region. Nice analysis Sir – I only have conclusion/s; thanks for the details/histories involved if I may state so. "These are the same group that USA has been funding in Syria"
"So let me get this straight – fund them in Syria and bomb them in Iraq. WOW!" If you're an idiot who doesn't know anything about anything and thinks all arabs rebels=jihadists, then yeah, sure..you got it straight. They hate the Jews and always will .There will no peace on earth untill all MUSLIMS are destroyed. The greatest prophesy ever made. Absolutely true!!! Its a fact. It takes a ground army to attack and occupy the ground. Would it work? Is that a serious question? Clearly it did not work so why try it again. Where is that true? On the planet Idiotville? Up till now I have been totally against any involvement in Iraq . If Isis didn't have the bankroll behind them I would be happy to leave them bickering and killing amongst themselves. With ISIS unchecked I think the whole world is going to have trouble from this group . Dear President Obama , something needs to be done to stop this , air strikes I think are now necessary , I hate war and what it does but ISIS needs to be stopped now . When are we Americans going to realize that the more we let our MIC (military industrial complex) shape AND CONTROL our foreign policy, by causing us to bomb the crap out of other countries, the more people from those countries are going to move to the US!!!!!!!!!!! WWI & WWII brought millions of Europeans to our shores. The Philippine wars (1890's and WWII) brought the Filipinos to the US, the Korean war brought Korean immigrants, the Vietnam war brought the Vietnamese here by the millions, the cold war collapse caused millions of Russians to run to USA, the Afghanistan and Iraq wars caused millions of Iraqis and Afghanis to race to America............ AND THEN WE SAY WE HAVE AN IMMIGRATION PROBLEM!!!!!!!!!!!!!!!!!!!!!!!!!!!!!!!!!!! Remember that the problem is not with the immigrants, without whom the US would never have become the superpower that it is, but with the economic problems caused by huge "American" corporations, like Apple, who send their manufacturing to China and elsewhere in pursuit of even greater profits. When the US needed more labor, immigrants were welcome. If all of the companies who have sent millions of jobs overseas brought them home, we would need more immigrants and unemployment would be almost non-existent. The corporate tax structure needs to be changed drastically and immediately to encourage those companies to manufacture at home and to punish those that do not. Utilizing several AC-130s to blast away the line of attacking small trucks, cars, and vans would go a long way. The US could also utilize some of the newer high tech weapons not yet tested in real battles. Cluster bombs would be necessary for structured troop movements. Carpet bombing only works in column movements. This would be a great place to test out the newest models of neutron bombs. They would see a bright blue light in the sky and they would think its beautiful until their skin melts off to the bone. Good grief Burt, you must really like bloodshed! Just what will butchering more people in the Middle East prove, Burt? Please tell me. If not, please quit vomiting your ignorance on this web page! With comments like the above, it's plain to see why they call ours a sick society! Would American pilots on the orders of American politicians murder thousands of kids with no conscience? you betcha. Thank you, markdonners. How so very true that is! No, shame on you, Michael. Do you remember how many civilians American pilots slaughtered in North Vietnam during the Vietnam War (1961-73)? Then again, there was the infamous bombing of the Amriya air raid shelter in Baghdad, Iraq on Feb. 13, 1991 in which well over 414 innocent civilians were mercilessly slaughtered! So please, quit touting these guys, will you? Its a futile effort @ Joseph. People like Burt would applaud if we just obliverated the whole country! No conscious at all! God forgive them! He'd better chrissy, since I will definitely not! ... no air power, no air strike, no war, ... we need peace negotiations and peace keeping NATO forces on the ground. Amen @ Elliot! So why do you think our government hasnt addressed this? As a VET that served 2 tours in Iraq ( the first 15 months during the surge and 9 months closing down our bases of operations or FOB's) This is rediculous ..... THE IRAQI Gov decided that they no longer needed or wanted the help of the United States and said that they would IMPRISION and send to trial any United States service member that was involved in the shooting of anyone that was considered a non combatant by their government. Now just over 2 years later they are asking us for air support and we are now faced with sending more boots to cover the ground that was already won with our blood..... I SAY NOT AGAIN!!!!! NO MORE OF OUR PEOPLE SHOULD DIE FOR THOSE THAT WONT STAND UP FOR THEMSELVES!!!!!! Let Iran help Iraq – both leaders at the moment belong to the same religious sect. Cannot we just get away with fossil fuel? How about Russia, Saudi Arabia, Israel, and China getting united? The issue with Paracel Islands and Spratleys is akin to that of the Hawaiian and Falklands Islands. It reminds yours truly of Nostradamus' chronicles: among others,the situation in the Middle East ever since. Air Power! Nothing the US does will help in Iraq. These people are brainwashed Muslims hell bent on creating a country with sharia law. Then the goal will be to spread their idiotic religion around the world. Let them kill each other as they seem to enjoy it. Show the IRAQI people how to make IEDs and plant them on the roads that ISIS is using. ISIS is using US made vehicles to advance and when they do KA BAMMMMMMMMMM. That will slow them down a little and we don't have to use SUPER SONIC AIR SUPERIORITY FIGHTERS that cost tens of thousands of dollars an hour to operate when including support services, Multi-Billion dollar aircraft carriers. Let them do what they are already proven to be very good at. Then they can plant the bomb and RUN. I don't understand how U.S. Aircrafts can be in Qatar and other Middle East region if there are claims that Qatar is funding the ISIS. It seems very two-faced to me. Clearly US foreign policy is failing to solve a conflict in a region beset by many variables. Also, people in the M.E. cannot stop nor seem willing to want to stop the violence. Religion clearly is not to blame, only the people who promote , fund, and commit the acts of violence in a region where common decency is absent are at fault. Air strikes should not be used by the US except in defense of the U.S homeland. The ISIS is a movement gaining control of a region where there is a power vacuum where might is right and the innocents will pay dearly. "If permission were granted by the host nations" is the most ridiculous sentence. Did US ask any government of countries like Afghanistan, pakistan, Yemen or Iraq to drone attack or otherwise kill their people?